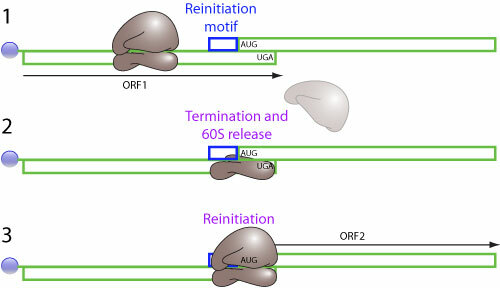 Ribosomal termination-reinitiation (also referred to as stop-start) is a process which allows expression of a downstream ORF in a bicistronic mRNA. This process depends on an upstream sequence element denoted termination upstream ribosomal binding site (TURBS). In this process, ribosomes translate the upstream ORF but following termination, a proportion of 40S subunits remain tethered to the mRNA and go on to reinitiate at the start codon of the downstream ORF. This termination-dependent reinitiation strategy allows the coupled expression of products from adjacent ORFs and thus the production of a defined ratio of gene products. Host translation factor eIF3 enhances reinitiation efficiency . Viral termination-reinitiation has been observed in vertebrates and fungus.